so, the kid fell from the bed to the floor this morning. i’m not really surprised, after all, he’s 9 months old, i figured it was bound to happen. what’s surprising was that it hasn’t happened sooner, given how active he is. roque usually slept in his crib, but we decided to co-sleep last night because we missed him (he just came from his weekly sleepover at his grandma’s and all baby tantrum memories of the week past have faded) and it was a bit chilly so i worried he might be cold sleeping all alone (i didn’t want to give him a blanket because i was terrified it would somehow wrap itself around his head and he would suffocate. yes, i have issues. i know this). about half an hour before the fall, i got up to pee and returned to find that he had shifted positions while i was gone. he was now lying kind of diagonally-horizontally across the bed, his upper body where mine had been. there was space between him and the edge of the bed, but not enough for my body to fit nor for me to worry about him rolling off. i didn’t want to risk waking him, so instead of moving him, i wedged a pillow between his head and the bed’s edge and then laid back down somewhere near his waist-level. i started to doze off. at some point, i felt him stir but since his sleeping self did that regularly, i didn’t think anything of it. suddenly, i felt something soft and warm move above my head and when i lifted it to try to figure out what it was, my half awake brain registered some sort of unidentifiable moving blur. during the one point eight seconds it took for me to realize that the blur was my son and he had fallen off the bed, he hit the floor. he lay on his back in the tiny space between the bed and the side table, somehow having missed catching his head on the table’s edge. i gasped and scrambled off the bed to get him before he started crying, both of us still unsure about what had just happened. then alvin, who was sound asleep three seconds ago, was suddenly there and he was picking roque up and roque started crying and i heard alvin, his voice shaking, frantically trying to comfort him. i could tell from roque’s cries that he was more stunned than hurt and so i started to relax, and after a while, he was back to his usual smiley morning self. with roque’s first fall off the list, i feel like we moved up some sort of new parents ladder. i’m pretty sure more falls and tumbles are headed our way, but, for now, i’m grateful the first one ended as well as it did. my previous post was depressing, and, really, sweeping my arm out and sprinkling the world with bits and pieces of my depression wasn’t such a nice thing to do, what with christmas just past and a shiny, new year just in. hence, another entry. a happier one, hopefully. also, a couple of cups of coffee and a couple of hours spent browsing through other people’s cheery blogs have put me in a slightly improved frame of mind. meaning, while i am not yet ready to burst into song at any moment, i will also not instantly grab the nearest heavy object and throw it at someone who does an impromptu happy dance. i recently learned about smile therapy from a good friend. from what i understood, what you do, essentially, is fake a smile until it becomes real. apparently, your body can’t tell if your smile is genuine or not so it still releases endorphins, serotonin and natural painkillers, making you feel good and, well, not depressed anymore. so, i figured, maybe i’ll do a blog version of the smile therapy and write about happy things. my personal happy for the past few months is easily my son. he’s nine months old now and is never still. 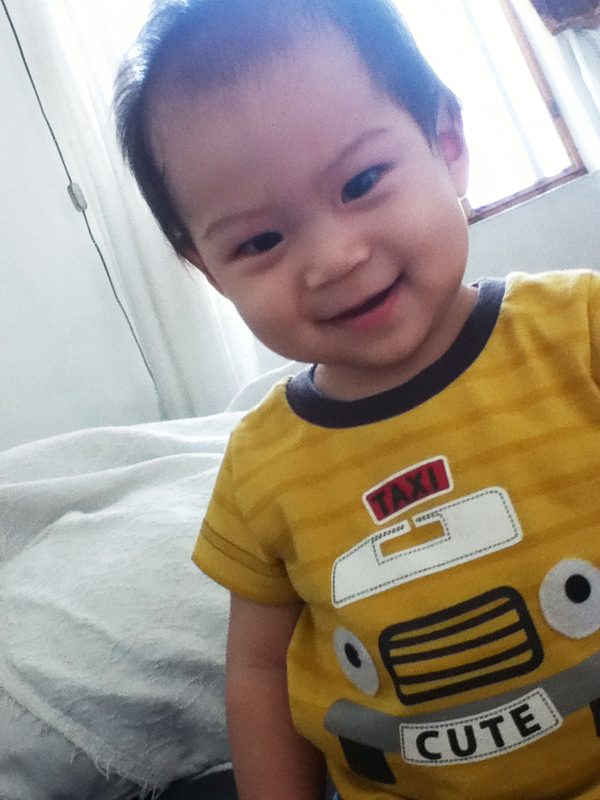 alvin and i come home each day to bright, mischievous eyes and a small playful smile hovering over his lips. truthfully, i still don’t fully understand how grumpy me could’ve produced such a smiley little boy, but i am grateful. so i hurry home to him everyday and beat my husband through the front door so i get to smother him with hugs and kisses first, and i get rewarded with happy smiles and baby squirms, and then he’s off again, seeming to be in multiple places at once: crawling across the floor, standing by the sofa bed, pulling himself up next to the side table. and it is then, in those fleeting moments, my nose buried behind my son’s ear, breathing in his scent, my arms struggling to contain his nine-month-old excitement, my eyes drinking the sight of his face glowing with delight, that i find little pockets of happiness so clear it makes the struggle of breaking free of the humdrum of everyday worth it.